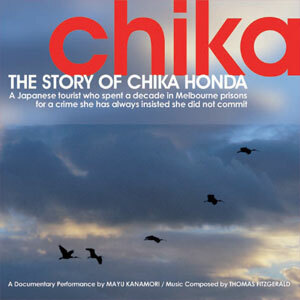 The radio program Chika featured on ABC Radio National's Radio Eye: Features and Documentaries in January, 2005. The program features original music by Tom Fitzgerald in collaboration with koto virtuoso Satsuki Odamura and narration by Mayu Kanamori. Sound engineering and design by Andrei Shabunov. Co-produced by Nick Franklin and Mayu Kanamori. The radio program Chika featured on ABC Radio National's Radio Eye: Features and Documentaries on the 28th February, 2004. Workshops for the documentary performance CHIKA were held in Melbourne in December, 2003. Live music by composer Tom Fitzgerald and Satsuki Odamura and physical performance by Yumi Umiumare was successfully integrated with Mayu Kanamori's documentary of Chika Honda's story under the direction of Malcolm Blaylock and filmed by Jon Armstrong. This project has assisted by the Commonwealth Government through the Australia Council, its arts funding and advisory body's New Media Arts Board.